On Sunday [Jan 28], Mount Saint Agnes Academy [MSA] begins its annual celebration of Catholic education through Catholic Schools Week. A spokesperson said, “On Friday, January 19, 2018, Mount Saint Agnes Academy held a Mass celebrating the Feast Day of Saint Agnes, Patroness of MSA. 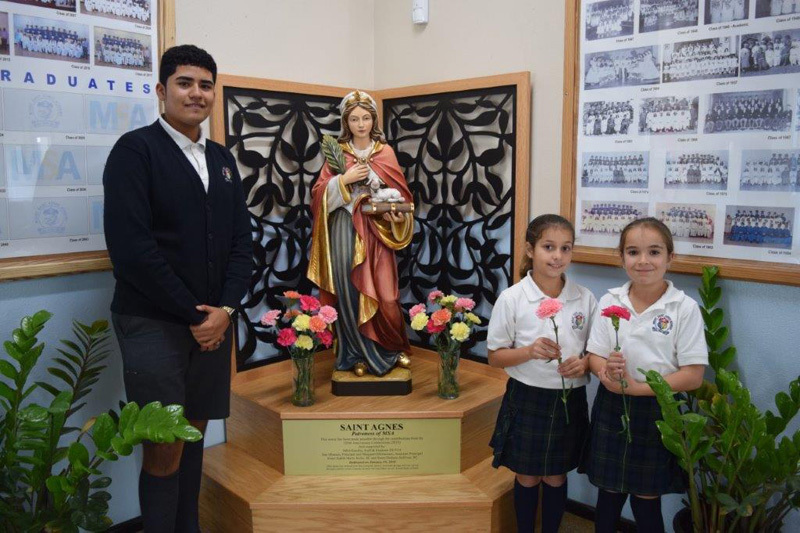 As part of the service, our new Saint Agnes statue was unveiled and blessed by The Most Reverend Wieslaw M. Spiewak, C.R., D.D., Roman Catholic Bishop of the Diocese of Hamilton, Bermuda. “The statue was ordered through The Carmelite Sisters, Colorado Springs and was hand carved in Italy. MSA would like to thank all who attended the Mass and give special thanks to those who made the acquisition of the new, beautiful statue possible: the MSA 125th Anniversary Celebrations contributions ; the MSA Faculty, Staff, and Students 2017/18; Sue Moench, Principal and Margaret DiGiacomo, Assistant Principal; and Sister Judith Marie Rollo, SC and Sister Dolores Sullivan, SC. “On Sunday, January 28, 2018, MSA begins its annual celebration of Catholic education through Catholic Schools Week. We strongly believe in the benefits of a Catholic education and our internationally recognized Alberta Curriculum. Well done my Alma Mater !